Jamie Dimon Regrets Calling Bitcoin a Fraud…. Next Would Be Warren Buffet ? Jamie Dimon is Chairman, CEO and President, of JPMorgan Chase, the largest of the big four American banks, and previously served on the board of directors of the Federal Reserve Bank of New York. Dimon was included in Time magazine's 2006, 2008, 2009, and 2011 lists of the world's 100 most influential people. He was also on Institutional Investor's lists of best CEOs in the All-America Executive Team surveys from 2008 through 2011. On Sep. 12 of last year, Dimon said that bitcoin is a “fraud” that will eventually blow up. "It's worse than tulip bulbs, it won't end well. Someone is going to get killed," Dimon said. Soon after he opined that. bitcoin fell to its session lows. By the time, bitcoin traded at around $4,000, down 2 percent. Following his controversial comment, on October he made another statement “If you're stupid enough to buy it, you'll pay the price for it one day". But, in an interview with FOX Business yesterday, Dimon said he “regrets” his statement of bitcoin. "Blockchain is real. You can have crypto yen and dollars and stuff like that," Dimon told Fox. However, Dimon made clear he was not going to become a cheerleader for bitcoin any time soon. 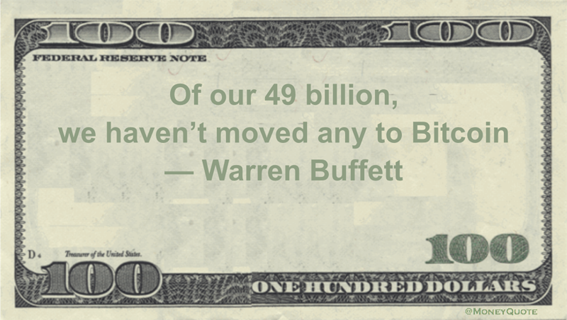 What Warren Buffet thinks about Bitcoin ? Similar like Dimon, not everyone is excited about Bitcoin or at least showing it. One of these people is Warren Buffet. Buffet is a big name when it comes to receiving investment advice. In fact, journalists, as well as businessmen and women never miss an opportunity to ask for this opinion on investment assets. Several times a year, the Oracle of Omaha, as he is fondly called, holds a casual event in his hometown of Omaha, Nebraska, in which business students ask him questions about a myriad of finance and investing topics. When asked what he thinks about Bitcoin, the oracle of Omaha said "People get excited from big price movements, and Wall Street accommodates. You can’t value Bitcoin because it’s not a value-producing asset." This is not the first time Buffet is coming out against Bitcoin. On March 2014, when Dan Gilbert, Quicken Loans founder solicited his opinion of Bitcoin, Buffet simply replied bluntly "It's a mirage, basically, stay away from it". By the time bitcoin traded around $600. While Warren Buffet may be a well-known investor, it is on record that when it comes to investing in technology, he often missed his chances. In fact, he admitted to this himself. Buffet has previously admitted that he doesn't understand how tech stocks work. In fact, he is known to always shy away from tech investing. During the annual meeting at Berkshire Hathaway on May 2017, Buffet admitted to shareholders that he missed his chance to invest in Google and Amazon. These are two big tech companies and the failure to invest when he had the chance shows his limited understanding and trust in techs. Bitcoin without a doubt is a tech at its peak. Buffet admitted his ignorance on other big technology stocks because he did not understand their value proposition. In his own words; "I avoided tech stocks in the past because I don't understand how they were making money and whether they would be able to do so over the long term". Going from the above statement credited to Oracle of Omaha, he is not investing in Bitcoin because he thinks it's a mirage and won't last. In fact, he first called Bitcoin a mirage in 2014 when the value was $600. Three years later, Bitcoin is stronger than ever and even traded at $20,000 a few weeks ago. Clearly, Bitcoin is not a mirage and will continue to get stronger than any other financial instrument because it is very limited. The potential to make money from Bitcoin is massive. Don't let any investor sway you from making your Bitcoin investment now you have the chance. Bitcoin gained its biggest popularity in 2017. Already, 2018 has been predicted to be the Bitcoin Boom year, you need to invest even the little amount you have now on Bitcoin and any other cryptos. NOTE : There is another reason why most known investors are nay-sayers when it comes to giving Bitcoin advice. Here is what you are not thinking: People take investment advice from well-known investors like Buffet seriously. So when they say don't invest in Bitcoin, they are probably trying to sway you from investing, which will lead to the value crashing. Secretly, they will invest in the same Bitcoin and sale it back to you at a higher price when you finally make up your mind to start investing. At least he is sorry for what he said and regretting now is kinda late to be honest. he could have been a whale if he had the foresight. He's clearly having regrets. Better late than never! You got a 4.48% upvote from @allaz courtesy of @sonny.dharmawan! This post has received gratitude of 1.26 % from @appreciator thanks to: @sonny.dharmawan. This post has received a 13.39 % upvote, thanks to: @sonny.dharmawan. You got a 4.07% upvote from @postpromoter courtesy of @sonny.dharmawan! Want to promote your posts too? Check out the Steem Bot Tracker website for more info. If you would like to support development of @postpromoter and the bot tracker please vote for @yabapmatt for witness! You got a 1.48% upvote from @upme requested by: @sonny.dharmawan.